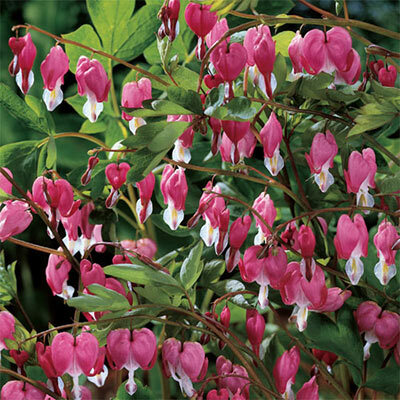 Lovely, heart-shaped pendant flowers. Ideal for inter-planting with spring bulbs such as daffodils, as they will hide their dying foliage. Great combination with ferns and hostas in the shade or woodland gardens. Bushy clumps of powdery-green foliage comprised of cut or lobed leaves. Remove faded flowers regularly will promote lots of new buds to form. Mulch +/- 2" the first winter and remove before grow start.